San Francisco Bay Area may be the nation’s first region with 10,000 electric cars. It could happen in 2012 for the region with 7 million people and 5.3 million vehicles. Electric utility PG&E reports that they are now charging 1,800 Nissan LEAFs and 250 Chevrolet Volt residential owners. Add to these numbers a growing number of electric car fleets that include Google, Bay Area Air Quality Management District, and the U.S. Navy; 4,000 freeway-speed electric vehicles in the SF Bay Area are forecast by the end of this year. I’ve personally been to meetings where 50 of the attendees arrived in their Nissan LEAFs, Chevrolet Volts, Prius Plug-in Hybrids, and Tesla Roadsters. Also on the road in the Bay Area are test vehicles including Ford Focus Electric, Honda Fit Electric, Tesla Model S, Mitsubishi I, electric trucks and electric motor cycles. CityCar Share is ordering 15 battery-electric cars and 15 plug-in hybrids, giving these cars wide exposure to its thousands of members. The Bay Area is the home of cities where one in five drive a Prius, Silicon Valley innovators aspire to be the next Steve Jobs, and Tesla opens a new plant with aspirations to make the U.S. the world leader in electric vehicles. Over 1,000 electric car chargers now appear to be installed in the San Francisco Bay Area. More new EV owners are trickle-charging their cars as they wait for backlogged wall chargers to be installed by backlogged electricians dealing with backlogged utilities and city inspectors. During the next two years over 5,000 chargers, formally labeled electric vehicle supply equipment (EVSE), will be installed in the Bay Area. Although homes are the primary point of charging, electric car drivers like me are extending their range by using over 100 public charge points in the Bay Area installed by Coulomb Technologies and others. 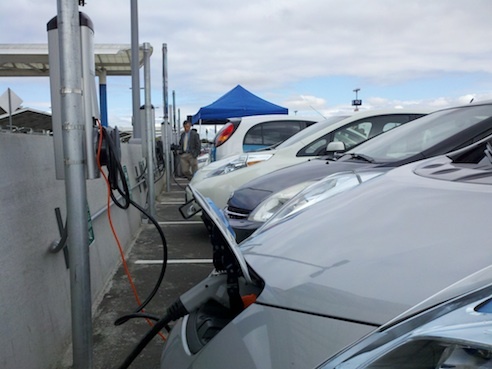 Major employers are installing chargers for their employees, fleets, and visitors. Google has 70 charge stations for its over 100 employees who drive Teslas, LEAFs, Volts, and other electric cars. Damian Breen, Director at the Bay Area Air Quality Management District, reports that over 1,000 public charging stations are being installed in the Bay Area. Most are Level 2; some are dual stations with one Level 2 and one Level 1 outlet. Also planned are 6 DC Fast Chargers to be installed in the next 12 months; 50 are scheduled to be operating by the end of 2013. These DC Fast Chargers, similar to the CHAdeMO chargers successfully used in Japan, can add 60 miles of range for a typical electric car in about 20 minutes. In 2012, Nissan, GM, Ford, Toyota, Honda and others are offering ten different electric car models for less than $40,000. Leases start at $350. During the next two years, automakers are building new plants and expanding existing plants to keep-up with customer orders for electric cars. Are there any numbers on how many vehicles are using mainly solar power (PV) for charging?